Product Description: Social network app for iOS and Android mobile platforms. The purpose of the QA services for the project was to check the entire range of features and further stabilization of the overall product functionality for AppStore and Google Play submission. The app has a wide range of features required in modern social networks. 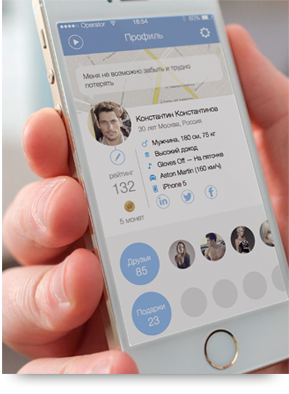 A user starts from managing a friend-list and communication, and at the same time has a possibility to view the profiles of guests and recommended user. Quality assurance and regular expertise of the mobile app during the lifecycle of development. Adapt the application for Ipad (Retina), identify defects . Provide a high level of product quality for ranking improve in the AppStore and more users attraction. In order to ensure cross-platform support for the app, the QA team used a bunch of devices from the own mobile devices park for testing. Development and testing activities were performed on two streams in parallel, that resulted releasing the product on IOS and Android met the deadline; As the information about the supported third-party services has been requested on the early stages that allowed to develop and test the integration with more than 7 third-party systems (payments, geolocation, other social networks). Beta testing was conducted with the use of internal human resources of our company. The product supports different generations of devices and screen resolutions, as well as for different versions of operating systems. The team detected more than 200 defects of high and medium priority, not considering the numerous of user interface and compatibility defects. The App has been distributed simultaneously for IOS and Android with proper quality. As a result, the application was submitted by both commissions and now is available in AppStore, Google Play. Thus, the application was successfully implemented and supported for these platforms and operates on more than 2 million users’ devices.